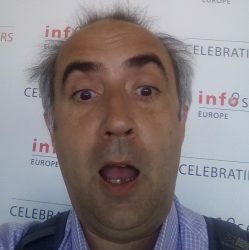 Leon Juranic from Croatian security research company Defensecode has written a rather good summary of some of the nasty tricks you can play on UNIX sysadmins by the careful choice of file names and the shell’s glob functionality. The shell is the UNIX/Linux command line, and globbing is the shell’s wildcard argument expansion. Basically, when you type in a command with a wildcard character in the argument, the shell will expand it into any number of discrete arguments. For example, if you have a directory containing the files test, junk and foo, specifying cp * /somewhere-else will expand to cp test junk foo /somewhere else when it’s run. Go and read a shell tutorial if this is new to you. Anyway, I’d thought most people knew about this kind of thing but I was probably naïve. Leon Juranic’s straw poll suggests that only 20% of Linux administrators are savvy. Chmod also has --reference option that can be abused to specify arbitrary permissions on files selected with asterisk wildcard. Oh, er! Imagine what would happen if you created a file named “–reference=myfile”. When the root user ran “chmod 700 *” it’d end up setting the access permissions on everything to match those of “myfile”. chown has the same option, allowing you to take ownership of all the files as well. It’s funny, but I didn’t remember seeing those options to chmod and chown. So I checked. They don’t actually exist on any UNIX system I’m aware of (including FreeBSD). On closer examination it’s an enhancement of the Linux bash shell, where many a good idea turns out to be a new vulnerability. That said, I know of quite a few people using bash on UNIX. This doesn’t detract from his main point – people should take care over the consequences of wildcard expansion. The fact that those cool Linux guys didn’t see this one coming proves it. Come back tomorrow and I’ll tell you how to get rid of it!